Generate Java and C++ SNMP agents from a set of MIBs within a few minutes. Get high quality code really fast! Automate your SNMP implementation with roundtrip engineering and fully customizable templates now. Open source code generation back-end based on templates. Code generation templates are included for AGENT++/AgentX++ (C++) as well as for SNMP4J (Java). Roundtrip Engineering: Merge with existing code is supported (even for customized templates). Templates can be used to specify what files should be updated or newly generated and also which MIB information is used for which file. Custom properties on MIB nodes. Properties are inherited by sub tree nodes. MIB editor with syntax highlighting, background compiler, and pretty printing. A very precise MIB compiler which can be used to check MIB files for compliance with SMI (and PIB). Project support and command line interface for integration in your build environment. 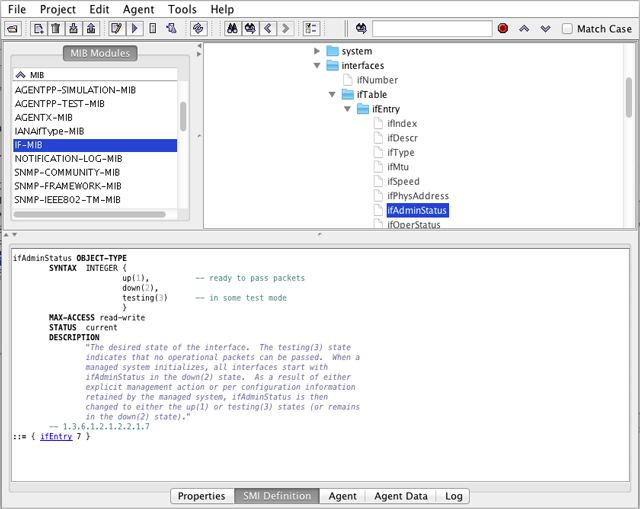 Formatting of MIB files and HTML export of MIB modules. SNMP object value initialization and trap/notification template code generation (already integrated in SNMP4J templates). Maven-Plugin for integration of AgenPro into Java based build environments.